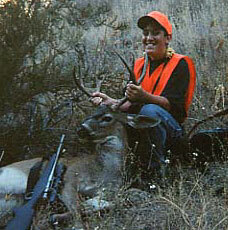 This is Greg Vieira, my 12-year-old son, and his first buck. 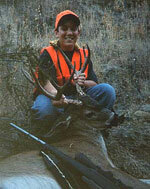 He shot this nice 4x3 at Cache Creek Elk Refuge in California on August 19, 2000. He took it with his .243 at 160 yards at 8:00 in the morning. It was a nice lung shot, never saw one drop so quick  like you turned off the light switch. I am really proud of Greg. Some people have said he was too young to deserve this buck, but I tell them that he has accompanied me hunting since he was 4 or 5 on more than 40 deer hunts as a junior hunter in training. He had already paid his dues before he was old enough to get a tag.